Entertaining Food: Oh, Pabla: Why Are You So Delicious? Oh, Pabla: Why Are You So Delicious? 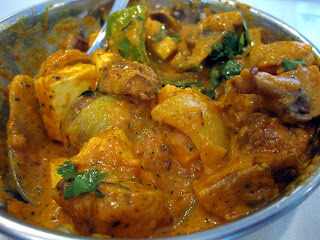 My best friend Chris and my favorite Indian restaurant is, by far, Pabla India Grill in Tukwila. Despite their website not having been updated to include this location yet, you know a restaurant has delicious food when you go out of your way (by 20-30 minutes) just so you can sneak in before the everyday lunch buffet ends mid-afternoon. Ironically, even if we are milling about on the weekend in Bellevue, the drive is never too far to satisfy our craving for sweet and savory Indian goodness. Regardless of how many times we eat there, we've slipped into a comfortable routine that includes ordering one type of each of the following: samosa, pakora, nan (or naan, depending on where you're dining), and masala. 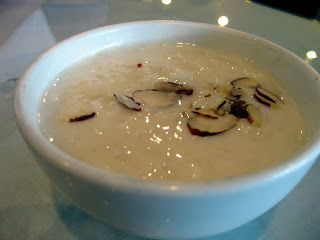 Of course, we also lap up a bowl or two of the kheer for dessert and this visit proved to be no exception. The Vegetable Samosas are a guaranteed comfort food no matter where you're from. The pastry is always buttery and flaky (think savory pie dough) and the filling is bursting with well-spiced potatoes and peas. It's impossible to eat just one and we often end up eating at least two each. As usual, we alternate dousing them with the cool and spicy cilantro chutney or the sweet and savory tamarind chutney. Those sauces are so good, there are usually six or eight condiment bowls of them on our table shared between just the two of us. The combination of warm, savory, spicy, and cool...whew! You'll find it difficult NOT attending the buffet. As our Indian dining habit suggests, a pakora was next. While I often order the Paneer Pakora to help feed my complete addiction to paneer, this time we chose the Chicken Pakoras. Holy fingers of goodness! 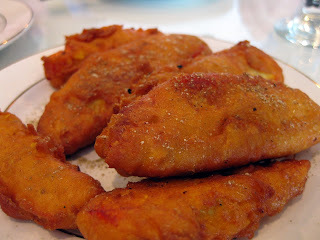 The chickpea batter was light, crispy, a bit spicy, and very well seasoned. The chicken was ridiculously fresh and juicy. Literally, Chris and I looked up from our respective plates and gave each other the, "OMG. Honestly. How are they this good?" look. I didn't shut up about them for at least a week. We were so thrilled with how surprisingly good they were, we've ordered Chicken Pakoras other places and have always been disappointed. These really are the perfect "chicken finger". Nan at Indian restaurants is as ubiquitous as "chips and salsa" at a Taqueria, but it can make a big difference to the overall food experience if it's great. 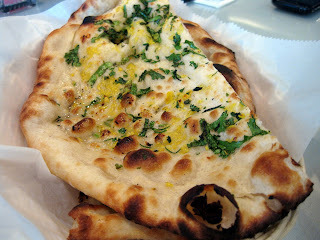 The Garlic Nan at Pabla is so flaky and flavorful, it would be a shame to pass it up. It's crispy and sturdy enough to hold spoonfuls of your favorite masala or curry, yet tender enough to fold taco-like for easy chowing. Pabla features several types of nan including spinach, paneer, and cauliflower, as well as a "special nan" that includes nuts and dried fruit. They also have puri (puffy wheat based bread; think sopapilla) and parathas (also whole wheat based), among others, for over a dozen various bread accompaniments to dinner. Chris waffles between Chicken Tikka Masala and Butter Chicken as his must-have entree and the former won out during this dinner. Even at four or five stars, the tender, yogurt-marinated and tandoor-cooked chicken chunks swim through the luxurious tomato and cream sauce and right down your gullet. It's often by this point in the meal that Chris starts uttering nonsense like, "I'm starting to get full" or ridiculous notions of "Taking the rest home in a doggie bag". Of course, given another five minutes, his masala bowl will be spotless and the nan nowhere to be found and this dish is usually the cause of him being completely unable to say no. If you're new to Indian food, this is probably one of the most accessible and delicious dishes you can try. One bite and you'll be hooked. As for me being hooked, my new favorite entree is the Pabla Special Masala, mainly because I adore anything with paneer in it. That said, the quartered mushrooms, large diced onions and peppers, and sinful cubes of paneer can't help but play nice while surrounded by the velvety ginger, tomato, and onion sauce. At four stars, it packed enough heat to cause sniffling, though the only tears that came to my eyes were when my spoon scraped the bottom of the empty bowl. 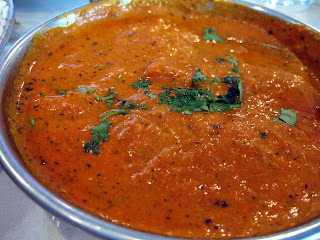 I really feel that Indian food is as much about the sauce as it is the bites floating in the sauce and this dish delivers a rich, creamy, flavorful sauce that's worth dipping everything else into. As has been our tradition for a while now, we generally end our meal with Kheer. For those of you who have never tasted this creamy, porridgy delight, think rice pudding. It's made with milk, sugar, and usually basmati rice, but isn't cloyingly sweet like a lot of rice puddings thanks to the cardamom and almonds. The kheer is served chilled and we've yet to eat just one bowl of it while attending the lunchtime buffet. With a buffet that features over 20 items for $10 (easily the BEST deal anywhere) and dinners worth taking anyone you love, it's no wonder why Pabla India Grill is by far my favorite Indian restaurant in the greater Seattle area. The 4 Stars are well deserved. Ironically, this restaurant sits in the same strip mall as Miyabi Sushi and Bai Tong, so you can enjoy fantastic sushi or amazing Thai food before or after an incredible Indian feast. 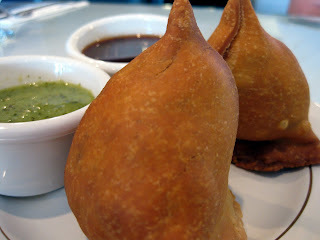 I love the look of the samosas...and the sound of kheer...one to make!!!!!! The naan is one of the reasons I keep going back to Indian restaurants. I love the freshly baked goodness. Try the garlic naan if you haven't already. Oakley Sunglasses Cheap After an hour, the entire water from the pale green color becomes somewhat filthy, out from the pool, just to feel refreshed.Sitting cross-legged on top of ruby bed, took the ice YORK tactic closed his eyes, according to the above formulas Heart start Discount Oakley Sunglasses Outlet Online practicing again. Oh black girl walked around, it needs to know to practice it, and it is the body unconsciously attracted to that kind of atmosphere.Into ice from water based, taking the essence of heaven and earth thousands of water into the plume at the moment, but relies instead on the entire flash hole will be covered with a whitish spot repair the soul of this child, has a great body repair talent, maybe he is God who selected it for my old cheap watching the scene could not help himself. Cheap Oakley Frogskins Sunglasses One hundred and seventy first chapter empty old call suddenly opened his eyes, those surrounding plain shade point open to dissipate .